Ms. Mallay was educated by the Sisters of Mercy in Stephenville Crossing and was given a strong foundation in the ministries of education from these outstanding educators. Ms. Mallay pursued a degree in Arts( English/French) and Education(Secondary). This is her 18th year at the school and has extensive training in Jesuit Education such as symposium cohort, assistant principal cohort and Seminars in Ignatian Leadership cohort training. Ms. Mallay completed her Masters of Educational Leadership studies from Memorial University and her three paper folio thesis was on the subject of Jesuit Education. Upon graduation, Ms. Mallay taught ABE Literacy and Numeracy to displaced fishermen and women in Petty Harbour. From there, she began her secondary teaching at schools in the metro area. In 1999, after teaching in the Roman Catholic School Board for several years, Ms. Mallay began her teaching at St. Bonaventure’s College. 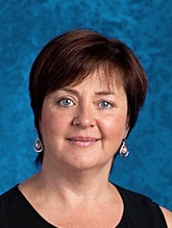 After 23 years of classroom experience and 11 years as the assistant principal, Ms. Mallay has ample knowledge of the day to day operation of a successful school. Her vision for the future includes a curriculum review and a renewed emphasis on what it means to be an Ignatian educational institution. Her focus will be the mission of the school and to always seek the Magis. She is an active member of the school’s Christian Service Program in her ministry at MacMorran Centre and is a team member in the sacramental program at her parish, Holy Family. Ms. Mallay has been involved with countless committees at the school from Leadership teams, Sports Day, Remembrance Day, Ignatius Society Dinner and Campus Ministry to name a few. With the outstanding staff at St. Bons, Ms. Mallay is enthusiastic for the future.